Does the U.S. Bond Yield Curve Predict Recessions? — Eclectic Associates, Inc.
As the U.S. economy approaches the 10-year anniversary of the current expansion, many are wondering how long it can keep going. Economists and investors are looking at hundreds of indicators, such as unemployment, housing starts, and money supply, to try to determine where the economy is in the business cycle. The bond yield curve is considered one of the most trusted predictors of economic growth and recessions. It has shown to be reliable not only in the U.S. but also in many other developed countries. While there’s a chance that what has worked in the past won’t work in the future, we routinely consider what the bond market may be telling us. 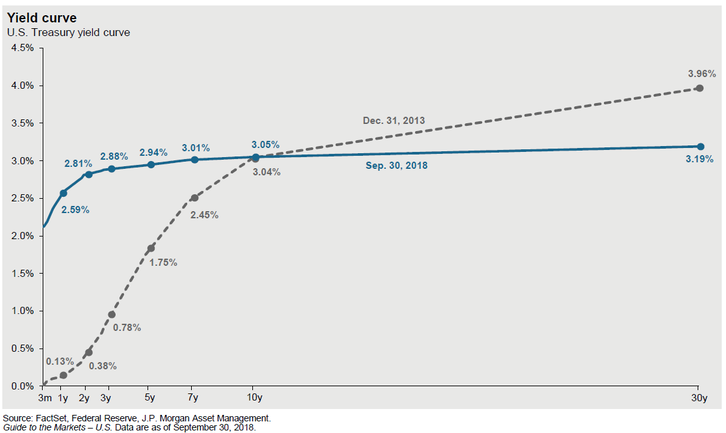 From an investor’s perspective, the yield curve is the chart of current interest rates offered by the bond market at various terms, from three months to 30 years. In Figure 1, you can see that the shape of the current U.S. Treasury bond yield curve (solid line) is flatter than it was at the end of 2013 (dashed line). It’s most concerning when the yield curve goes from flat to inverted. By inverted, I mean short-term interest rates are higher than long-term yields. For the sake of this article, I will consider the 90-day Treasury bill as the measure of short-term yields and the 10-year Treasury bond of long-term yields. Figure 2 shows that the past three times the yield curve has inverted (shown as the blue line dipping below zero), a recession followed shortly after (shown as the grayed-out time periods). The yield curve isn’t a perfect predictor looking further back in time. However, the relationship holds up statistically in other developed countries since 1970, according to the NBER. There is a good reason that potentially explains the correlation. Banks start to cut back lending when the yield curve inverts, which slows down leveraged businesses. This makes sense because banks need to earn more interest on long-term loans than the interest paid to depositors to be profitable. Another potential reason has to do with the expectations built into long-term yields. When the bond market starts to expect a recession, long-term yields will often decline because the market expects the Federal Reserve to cut short-term yields in a recession. The market currently expects three more federal funds rate hikes, adding 0.75% to short-term rates by the end of 2019. All else equal, the yield curve would still be flat but almost inverted. It’s worth adding that a flat yield curve can remain flat for years without inverting, as it did in the late 1990s. Even if the yield curve inverts, does that mean we need to start the recession countdown clock? Maybe not. As former Federal Reserve Chairwoman Janet Yellen recently suggested, this time may be different. Ms. Yellen pointed out that unusual factors in the bond market have lowered long-term interest rates, implying that the yield curve could invert without causing a recession. Monetary policy has become unorthodox. Never before have central banks had so much influence over the long-term interest rates. The Federal Reserve intentionally attempted to lower long-term yields by purchasing long-term bonds and holding them through various programs known as “quantitative easing.” The federal funds rate was held unprecedently low for most of the current expansion. An inverted yield curve doesn’t have to be bad news. Higher short-term interest rates are good news for investors. CDs, money market funds, and short-term bonds all pay a higher return, which puts more money in the pockets of savers and investors without needing to take on a lot of risk. Lower long-term yields help consumers by lowering fixed interest rates on debt, such as mortgages and auto loans, which can be locked in for the long term. For example, a low 30-year mortgage locked in during a recession can last beyond the business cycle. One last note about the current business cycle. Economic expansions don’t die of old age. The expansion has been not only one of the longest but also one of the slowest, with GDP growing only 2% per year. Recessions have occurred in the past, for example, because of overtightening monetary policy by the Federal Reserve (raising short-term rates too high or too fast) or a spike in commodity prices. In terms of investment portfolio construction, it’s extremely difficult to consistently time the market in the short term around recession risk indicators. In fact, we advise against it. There are just too many factors at play in our dynamic world economy. Rather, we recommend allocating to stocks, bonds, and alternative investments for a time horizon that matches your goal’s time horizon. For example, with money needed in the next 12 months, stocks and long-term bonds are inappropriate because they are inherently long-term investments that are more volatile. Please feel free to give us a call if you have any questions about your personal finances to see if Eclectic Associates can help.